You are in the market for new replacement windows and are not sure which products to consider. Last time, we looked at clad wood window choices like Pella, Marvin and Andersen. Perhaps your “old” windows are rotted or stick or you just aren’t comfortable with a wood product. Perhaps the thought of painting or staining is not attractive- you want replacement windows with as little maintenance as possible. In that case, vinyl replacement windows may be the right product for you. No longer limited to “White or Tan” on the exterior, these products can offer multiple exterior colors with some pretty nice looking wood interior laminates to give a more natural look. Gone are the days of the poor quality, inefficient vinyl replacement windows. 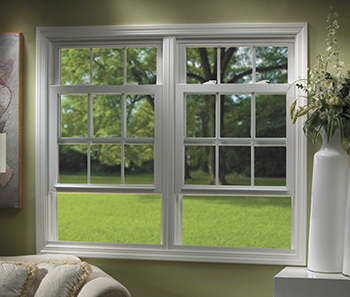 Today’s vinyl window products are efficient, durable and very affordable compared to their wood and fiberglass cousins. In our portfolio, Soft Lite, Revere and Vista are some of the best performing products on the market in terms of thermal performance and air infiltration. That is not to say that wood or fiberglass windows are inefficient, but in the lab, vinyl puts up better numbers. Like all products, there are some things to look for in a vinyl window that will ensure the best performance long term. Most of todays better vinyl double hung replacement windows will have a U Value of about .27 our of the box. Casements should have a U Value of about .25. Air infiltration (measured in CFM) should be under .10 and the lower the better. Our best windows are in the .02 range. 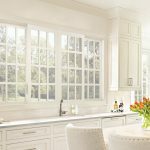 So what is the best vinyl replacement window for YOU? Cost is obviously a factor, energy efficiency is important, and aesthetics plays a role as well. Do you want a white window surrounded by stained wood trim? How long will you be in the home? etc. HomeTowne was designed to help you navigate these options and questions. We have all of our vinyl replacement windows on display in our showroom, or we can certainly meet with you on site to discuss options, features and benefits. Today’s vinyl replacement windows offer a great value without sacrificing performance or durability, but it is worth a little time and research to find the best fit for your home, style and budget.